WASHINGTON (November 17, 2015) — The bipartisan legislation to continue providing care and compensation to thousands of survivors and first responders who helped the nation recover in the aftermath of the September 11, 2001 attacks has 65 Senate cosponsors and 248 House cosponsors. It was introduced by Senators Kirsten Gillibrand, Charles Schumer and Mark Kirk in the Senate, and Reps. Carolyn B. Maloney, Jerrold Nadler and Peter King in the House. 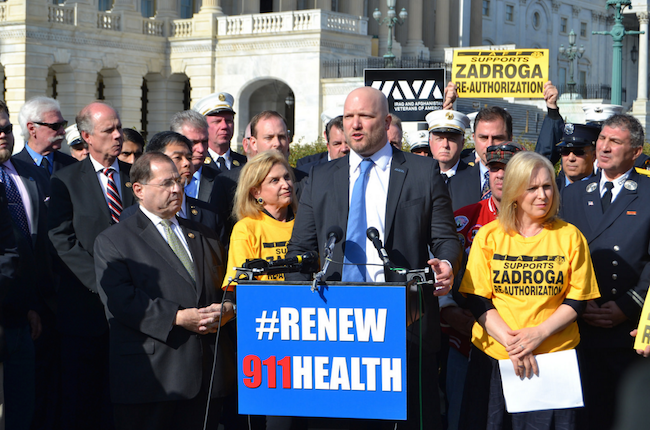 Several Members of Congress who are military veterans, including Senator Mark Kirk, and Reps. Chris Gibson, Tulsi Gabbard, Lee Zeldin,Ted Lieu, and Ruben Gallego joined IAVA and other veteran groups for the announcement, echoing the call for the reauthorization of the Zadroga Act. The announcement adds to the growing, widespread support the legislation has gained in both chambers to reauthorize and make permanent the health program, which has already expired, and fully fund the Compensation program. The legislation would permanently extend the World Trade Center Health Program and September 11th Victim Compensation Fund. The programs were created by the James Zadroga 9/11 Health and Compensation Act, which passed in December 2010, and was signed into law by President Obama in January 2011. The World Trade Center Health Program authorization expired at the end of September, and funding will run out by September 30, 2016. In the meantime, the program is in the process of shutting down, creating anxiety for those in treatment and problems for program administration, medical staff retention and continuity of care. There are 72,297 Responders and Survivors who are living in every State and from 433 of 435 Congressional Districts. There are over 33,000 Responders and Survivors have at least one 9/11 condition and over two thirds have more than one condition and a large number of those suffer from multiple injuries and illnesses. More than 4,166 Responders and Survivors have been certified to have a 9/11 related cancer, of which over 1,100 are New York City Fire Fighters and EMS personnel. Over 94 New York Police Department officers and over 110 Firefighters have reportedly died of their 9/11 injuries and illnesses, with more are expected in the coming years. The Victim Compensation Fund, also authorized for five years by the 2010 Zadroga Act, will shut down by October 3, 2016 and will not be able to fully compensate 9/11 responders and survivors unless Congress extends the program and fully funds it. To date, the September 11 Victim Compensation Fund has received 20,622 eligibility claims. Of those claims submitted it has found 12,150 eligible, has denied eligibility on 1,668 claims. The VCF has made 6,285 compensation determinations for injured and ill responders and survivors or their families totaling over $1.44 Billion.